On the 8 January 1940, rationing began in the UK, this first started with bacon, butter and sugar – later in 1942 meat, milk, cheese, eggs, cooking fats and breakfast cereals were also rationed. During the rationing period there were exceptions, these would have been fruit and vegetables as people could grow these at home and the government would encourage people to use their outdoor spaces for growing food. Certain people had exemptions, for example the armed forces, mine workers and the WLA (Women’s Land Army) as these were the people that were working hands on jobs and needed the strength. 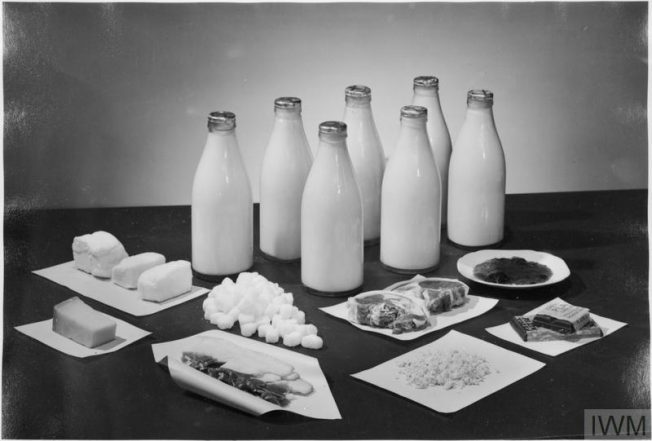 Pregnant women, babies and the sick were allocated additional nutrients, these would have been things such as; orange juice, milk and cod liver oil. Alcohol and cigarettes were also rationed and the prices were raised as the factories who produced these were focused on the war effort and building war related items. A family breakfast during rationing would typically have been; Wheaties – stale bread diced and dried in the oven attempting to keep a cereal as the morning meal. A slice of National Loaf may have been available; this was a government regulated loaf made of wheatmeal flour (made from ground left over wheat and husks) and added calcium and vitamins. Tea was also a staple for breakfast. At the start of the war, the government created a department called the Ministry of Food, this department closed when the rationing ended in 1958. A key part of the Ministry of Food was to make rationing seem positive and offer ways to enjoy the rations. They would carry out campaigns, post leaflets and deliver television and radio broadcasts. The leaflets would offer education on how best to use rations and reduce wastage of food, as well as exciting meal time recipes. These leaflets would also include many different recipes showing how to use the focus ingredient in multiple ways, in this example it was potato based recipes, some others mentioned; Baked Potatoes, Potato Soup, Potato Salad, Sweet Potato Chocolate Spread and Potato Scones. The sound of Sweet Potato Chocolate Spread and Potato Scones may sound incredibly strange now, however, it would have offered a sweet option for those during the war when sweet options were minimal. 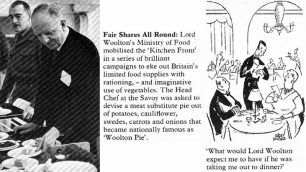 At the head of the Ministry of Food in 1940 was Frederick Marquis, Baron Woolton (known as Lord Woolton), during his time as head he created a pie that promoted the use of root vegetables, it was called the Lord Woolton Pie. The pie’s ingredients included; potato, cauliflower, swedes carrots, onions and oatmeal. By the end of the war people were a lot fitter and healthier due to rations forcing people to eat more vegetable dishes and people being physically active and walking more due to petrol rationing too. Sweets were scarce so children would be given carrot lollipops and drink Carolade, which was made from carrot and swede juices. Many believe that during the time of rationing Britain was at its healthiest, mainly due to the sheer amount of vegetables being consumed and also that the entire population was on essentially the same diet. The nations taste buds were bleak but people did try to make meals a bit more adventurous, if this were compared to current standards where are supermarkets full of ingredients to make all kinds of dishes, people still have a bleak taste, mainly opting for the quick version or fast food option where the true natural flavours and nutrients have been lost. The love of cooking hearty dinners for the family has been left behind with the war. David Heath, the agriculture minister in 2013 suggested that Britain should be “digging for survival” again, as he believed that we should not be relying solely on buying produce from abroad. This suggestion of using the space we have for growing vegetables and fruit may be a good idea, however peoplenow have the mindset of believing that we can just buy these things as it is more convenient and less time consuming. Modern culture has a lot to do with this as well, the current way of living is to work a full day, male or female, getting home to cook something quick, if people were to include digging and preparing the ingredients there would not be enough time.